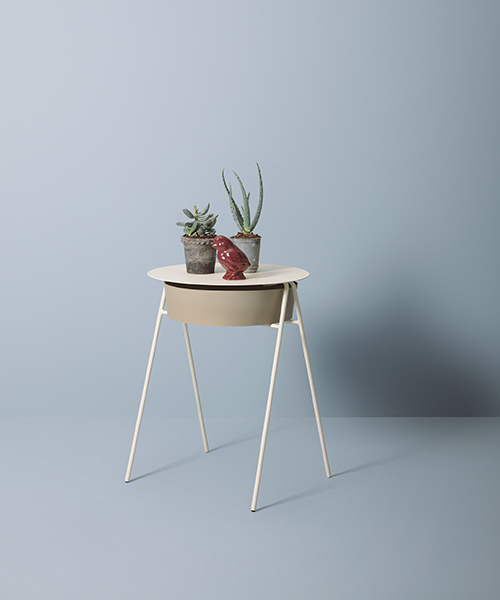 meaning ‘and go’ in spanish, yvé is a lifestyle project that creates essential yet not minimalist furniture that is as practical as it is playful. their debut collection will be revealed at milan design week 2019. from being movable to modular, the designs are incredibly versatile and often multi-functional. most notably, though, is their ability to transform a space – whether an office or a home interior – with a new character and for different needs. the furniture collection from yvé is composed of nine pieces. each component of every design has been made by skilled craftsmen in brianza, northern italy. 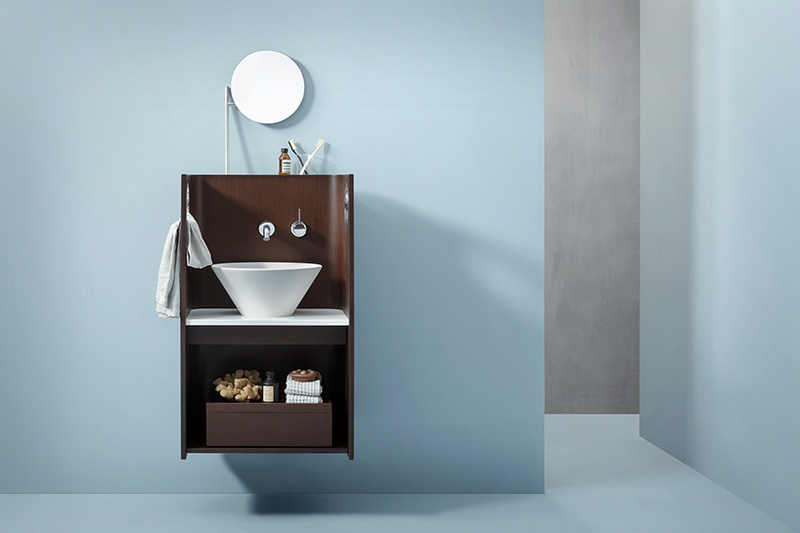 as a smart, space-saving solution, ‘pack’ unites different bathroom fittings and components into a highly functional, strong and charming structure. these can include existing items from mixers through to the towel rail. the light and easy-to-install design is crafted from veneered poplar plywood, which can then be colored mocha, white, or left in its natural wood finish. its flexible construction and personalization options highlight how the design can be tailored and fitted bespoke per setting. 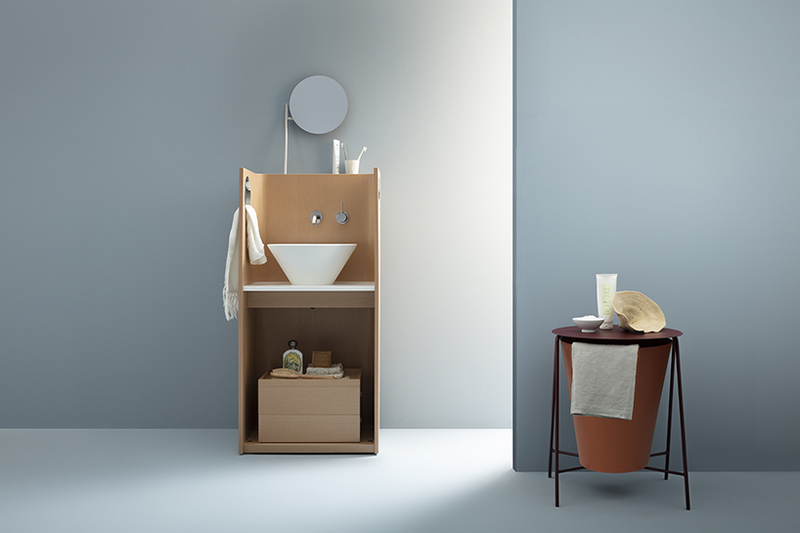 as another design with a strong character, the ‘uptown’ and its slightly smaller partner, ‘downtown’, is a container acting as a multi-functional accessory. the larger piece can also double up as a coffee table, tray or even a stool as it comfortably supports the weight of a person. surprisingly, it is constructed of a cardboard center covered with a basalt gray fabric and natural oak lid. its colors and materials combine seamlessly to distinguish a unique aesthetic within a space. 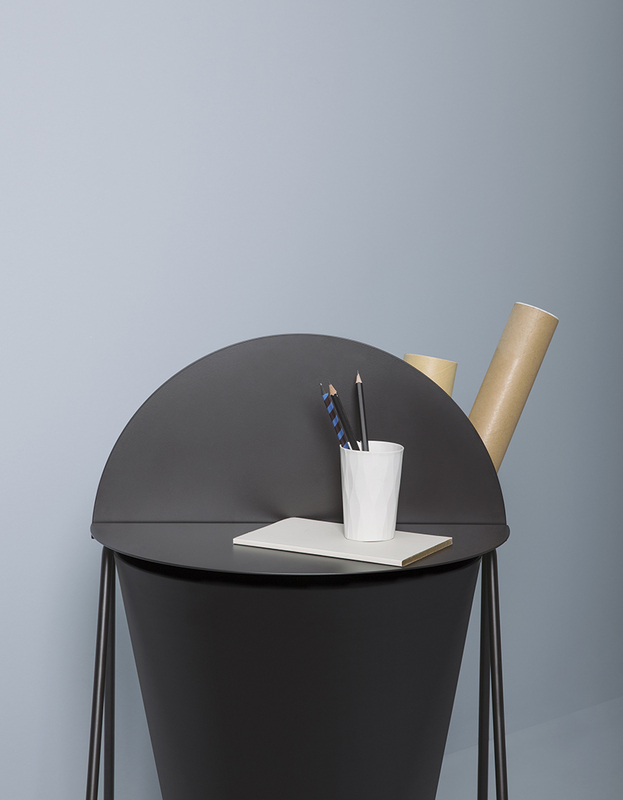 also available in two sizes, ‘OH!’ is a lightweight, multi-purpose design that can be used as either a table or vertical container. its careful curation of materials pairs lacquered iron with aluminum, before adorning a spectrum of selectable colors: white, black, burgundy/orange and beige/gray (a gloss version can be chosen as well). with a slim shape, the sculpture-like piece of furniture is quintessentially italian with passionate attention to details. designed and dedicated to being an actual coffee table, the ‘solar’ is similar to the slim shape of the ‘OH!’ yet fuses a few overlapping surfaces. 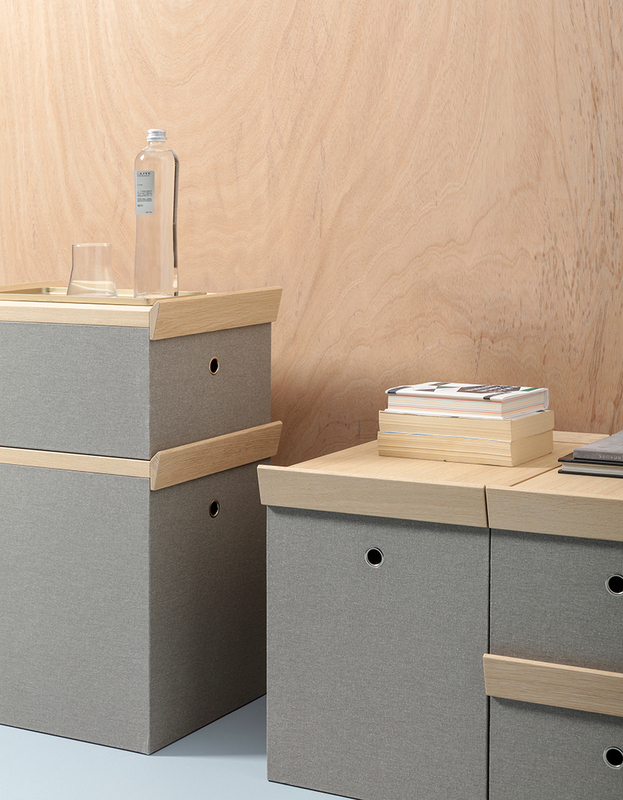 it offers a wide range of possible usage, especially storage, in comparison to traditional side tables. as well, this is delivered in a fashionable but flexible aesthetic crafted from lacquered iron – an extra glossy edition is also available. 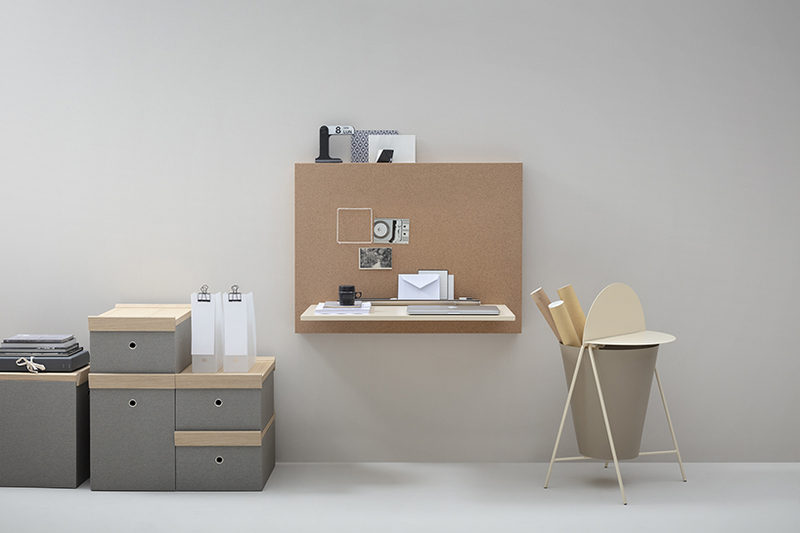 transforming parts of an interior into a small work space, the ‘my little office’ is exactly as its name suggests. it sources tangible and emotional inspiration from the wall boards of our childhood that were once decorated with important memorabilia from pictures to small items. yvé’s design combines a cork board with multiple accessories that can be added and removed instantaneously and with ease. no matter the interior, whether personal or professional, the design offers a small, portable office.